Nigeria will experience a spectacular lunar eclipse on Friday night, which will last one hour, said a professor, Augustine Ubachukwu. Ubachukwu, head of the research group in astronomy and astrophysics at the University of Nigeria, Nsukka, revealed this Thursday in an interview with the Nigerian news agency in Abuja. "Nigeria should experience a very spectacular total lunar eclipse on Friday, July 27, weather permitting, it will be visible from 9:30 pm and lasts until 11:22 pm. "This total lunar eclipse will be mainly visible from the eastern hemisphere of the world, which are Europe, Africa, Asia, Australia and New Zealand. "Part of South America will be able to watch the final stages of the eclipse just after sunset on July 27. New Zealand will catch the first steps of the eclipse before sunrise on the 28th. July. "It will be the longest total lunar eclipse of the century with one hour and 43 minutes total. 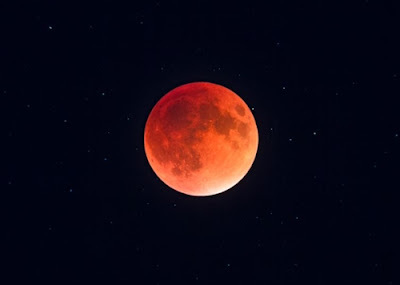 "It starts with a partial eclipse at 7:24 pm The total eclipse starts at 8:30 pm and ends at 10:13 am The peak eclipse will occur at 9:22 pm The partial eclipse ends at 11:19 am", he said. .
Mr. Ubachukwu observed that a lunar eclipse could occur only on the night of a full moon. The scientist said during a total lunar eclipse, the earth completely blocks direct sunlight from reaching the moon, while the only light reflected from the lunar surface would be refracted by the Earth's atmosphere. According to him, contrary to solar eclipses, lunar eclipses are safe for the eyes, without any eye protection or special precaution, because they seem paler than the full moon. The professor, however, said that the next total lunar eclipse that would be visible in Nigeria would take place on January 21, 2019. Another professor, Rabiu Babatunde, director of the Kogi Center for Atmospheric Research, told NAN that people should not be disturbed by the incident. Mr. Babatunde stated that the event underscored the fact that planetary objects, including the earth, were in a definite state of continuous motion. He said the event required scientists to continue to monitor and explore the dynamics of movement and the phenomena associated with them. "Keeping an eye on the dynamics will allow scientists to educate the global community about any danger associated with such events," he said.